Music has always played an important role in the films of Paul Thomas Anderson. Boogie Nights, his second feature, wore its Scorsese/Demme influence on its sleeve by letting a meticulously assembled soundtrack both set the tone and create the tension of some of its best scenes, while music was so important to the overwhelming emotionality of Magnolia that the film had no other recourse than to stop for a moment and let its cast sing an Aimee Mann song. Anderson's collaborations with Radiohead guitarist Jonny Greenwood, who has served as the composer for all of his films since There Will Be Blood, have only deepened that connection. As the films have focused less on plot and narrative and more on character and mood, Greenwood's music has played an ever greater role in sculpting the psychology of Anderson's increasingly obtuse works. 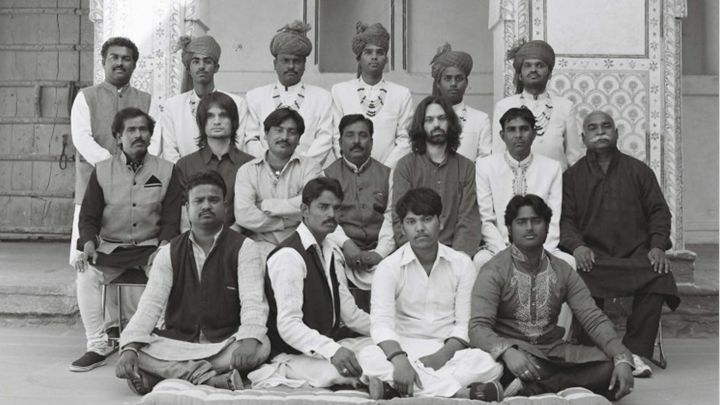 Their relationship and Anderson's evolution as a filmmaker seem to reach an apex in Junun, Anderson's short documentary about the recording of an album of the same name. In capturing the recording process, a collaboration between Greenwood, Israeli composer Shye Ben Tzur, and a group of Indian musicians known as the Rajasthan Express, Junun finds Anderson surrendering pretty much fully to the music being created. Aside from a few brief interviews with the musicians and the odd moment of chatter as they set up to record, there are very few words spoken throughout the film's 53 minute running time. There's no explanation for how the idea for the album came about, or what compelled them to record in the majestic surroundings of the Mehrangarh Fort in Rajasthan, India. The few excursions the film makes outside of the Fort into the surrounding areas are dictated by what feels right for the song being played, rather than because they might advance the story of the creation of the album. The music determines the rhythm of the editing, rather than the other way around. Even as it advances trends in Anderson's work, Junun also marks a significant departure: it's his first film to be filmed digitally, an especially notable change given his decision to shoot The Master on 70mm. That choice seems to have largely been a result of the frequent use of drones to capture images of the Fort and the surrounding area, which give a sense of what a unique location it is for creating an album. Considering the small scale of the production, it would have been prohibitively expensive to get those kinds of shots on film, so Anderson pursues the format that best suits the work at hand. However, Anderson doesn't treat the change as quotidian, or like a disagreeable compromise. Instead, he fully embraces the digital aesthetic, and uses the freedom afforded by it to capture the chaos of the creative process. While there are some beautifully composed images of both the recording sessions and of the Fort (one of the earlier shots, in which the camera rotates to show the musicians during a performance, is reminiscent of the graceful tracking shots in Jean-Luc Godard's otherwise interminable Rolling Stones documentary Sympathy for the Devil), for the most part the camera is allowed to roam. There are sudden shifts in focus, edits that don't pay any attention to continuity, and a sense of freedom and play, all of which make for a nice change for a director whose style has become more meticulous with each successive feature. Yet that playfulness is also what makes it hard to think of Junun as anything more than a lark. It's a very enjoyable lark, thanks not only to the great music on display, but also Anderson's clear love for the setting, but a lark nonetheless. It's an esoteric work from a major filmmaker, and one that looks like it provided a welcome opportunity for Anderson to get away from the grind of promoting Inherent Vice. Whether it augurs anything for Anderson's future work remains to be seen, but for now it's an immensely fun showcase for what sounds like an amazing album.